Brown hamburger and drain. Add soup mix, tomato juice, water and seasonings. Simmer for 5 minutes. Add rice and vegetables and simmer until vegetables are done. 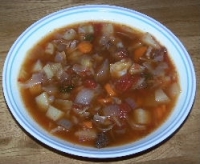 Recipe categories: Soups & stews, Main dish, One Dish meal.